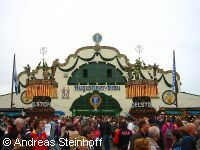 You want to visit the Oktoberfest in Germany? Need tips and advice how to get around in Munich during this busy time? Looking for accommodation, a tour or want to make a seat reservation in advance? On this page you will find all the info you need to be prepared for a fantastic experience. Munich is Germany's third largest city that attracts visitors all around the year. But can you imagine what the city is like during the Oktoberfest? When millions of visitors arrive to celebrate at the Wiesn? Busy, very busy indeed, and certainly a bit crazy, too. Of course it is also a lot of fun and an unique experience. It is a good idea to plan your trip and book a hotel in advance to have a relaxed time once you arrive. 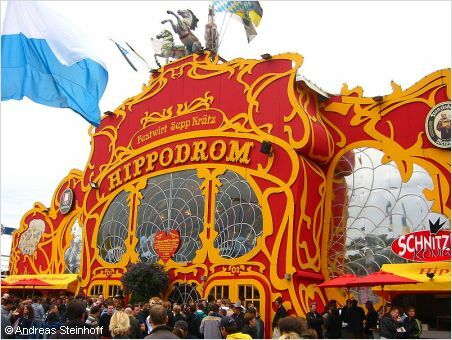 The colourful Hippodrom tent is not at the Oktoberfest anymore. Fans can still visit the tent at the annual spring festival on the Theresienwiese. What does the Oktoberfest cost? The good news is that there are no entrance fees! You don't pay to get on the festival grounds, nor do you pay to get into one of the beer tents. However, as the tents fill up quickly, especially on weekends, it is a good idea to make a seat reservation. You can make a reservation directly with one of the tents. The reservation is also free, but you have to buy coupons for food and beer starting from 20 €. Of course, it is possible to get into a beer hall without reservation when you are only 2 or 3 people. However, sometimes the tents get closed when they become overcrowded and it is a challenge for large groups to get in then. 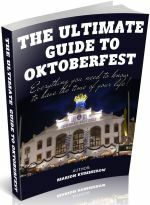 You'll find many more tips in my friend Marion's informative Oktoberfest guide book, just click the book on the left. When you drink beer, it is important to have a decent lunch and dinner to absorb all the liquid stuff. One Maß beer on an empty stomache, and you will fall under the table very soon. The traditional Bavarian food is hearty and delicious. During the Oktoberfest the Wiesn hendl (roast chicken) is the most favourite treat, very tasty. 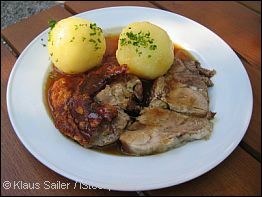 Other typical dishes are Schweinswürstel / Bratwurst (pork sausages), Schweinshaxen (pork knuckles), delicacies from the grilled oxen, and Steckerlfisch (grilled fish on a stick), and the brezn. 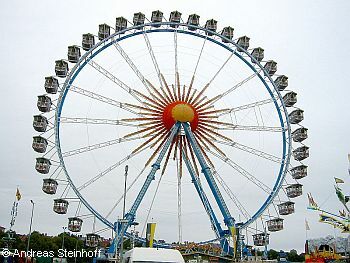 By the way, many food stalls and fun rides offer discounts during a time that is called the Mittagswiesn. From 10am to 3pm (Monday - Friday) they give discount on foods and activities. This is not obligatory & not valid in beer tents, so you can't expect it from all stalls, but many do join the Mittagswiesn offer. There is really a lot to try, so you don't need to be hungry :). Getting to Munich by train from major cities in Germany is quick and easy. There are ICE train connections from Berlin, Hamburg, Frankfurt and Cologne. Check for Train Ticket Offers . Once you are in Munich the best tip is to use public transport. Don't go to the Oktoberfest in Germany with your own car. You won't find a parking lot anyway. Apart from that, you want to drink beer, and you shouldn't drive then. The U-Bahn lines U4 and U5 bring you to the stop Theresienwiese, which is right at the northern entrance of the festival grounds. The Theresienwiese is about 15 minutes walking distance from the Hauptbahnhof (main train station), so you can even walk from many centrally located hotels in Munich. Don't take any chances and expect to find a last minute hotel in Munich during the Oktoberfest. You can be certain that the remaining available bed will be sold at astronomical prices. If you plan to go to the Wiesn, book your hotel well in advance. You can use the search box below to compare deals from different hotel booking agencies for Munich hotels. Just in case you don't find a room in your price bracket anymore, just try it in Starnberg, Dachau or Garching. These towns have quick and easy S-Bahn or U-Bahn connection to Munich.